Larry Foley’s Hotel, George Street, Sydney where a benefit boxing tournament was held to raise money for the widows and orphans of the Bulli Mine Disaster of 1887. 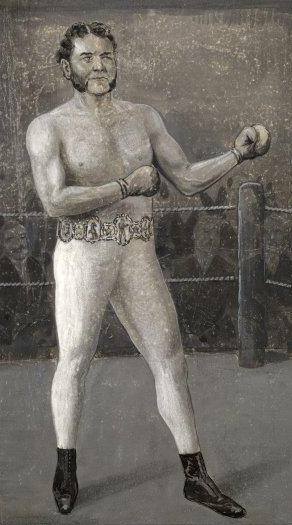 Larry Foley, who staged a benefit night, a boxing tournament, for the widows and orphans of the Bulli Mine Disaster in 1887 at his Sydney pub. 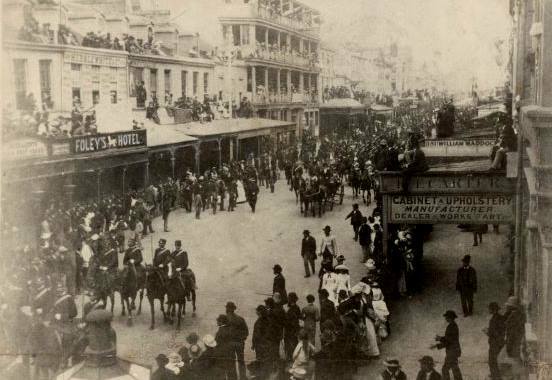 LARRY Foley’s White Horse Hotel in George Street, Sydney was just one of the “places of entertainment” that put on benefit nights for the widows of the men killed in the Bulli Colliery Disaster of March 23 1887. Sydney’s entertainers, sportsmen and women, all got behind raising money for the orphans and widows left behind after 81 men and boys were killed in the methane gas explosion at Bulli. The Referee, a Sydney sporting newspaper, reported on Thursday 31 March 1887 that Foley was just one of many of Sydney’s colourful entertainers that quickley pitched in to help. THE first responses to the cry of grief from the bereaved widows and orphans of the Bulli miners came from those who live by amusing the public. Larry Foley offered a full benefit at his athletic hall, he paying all expenses, and the whole receipts going to the fund. Messrs. Griffin and Evans volunteered simultaneously the whole proceeds of their usual Wednesday concert at the Manly Aquarium, and the Port Jackson Steam ship Company decided to give one-third of the receipts of their steamers for this day (Wednesday). Both the entertainments mentioned take place to-night. Mr. Foley brings on a host of attractions, and will himself take four rounds with Mr. John Thompson. The Aquarium concert is to be supported by Mrs. Leonard, Miss Graeme, Miss Ada Baker, Messrs. Knight Aston, E. O. Banemann, N. H. German, Claude Leplastrier, and Harry R. Woods. To-night also the Canterbury Congregational Church concert in the Athenteum, at Dulwich Hall, will be devoted to this object. Tomorrow night (Thursday) brings another list of appeals to public charity… On the whole, therefore, the public entertainers maintain their pride of place, and show themselves as warm hearted as ever. Let all classes of the community do as much, and the hearts of the widows will be rejoiced, and the wailing of the orphans turned into gladness….